Why does depth of field change with aperture size? Thread: Why does depth of field change with aperture size? I'm still very novice with regards to the technical apsects of photography, so forgive me if I sound daft but I would like to know; Why do you get a larger depth of field from a smaller aperture and shallower Dof for a larger aperture, and can anyone show me an easy to understand diagram of this? Have you studied the tutorial on DOF on the other part of the site? Last edited by McQ; 17th April 2009 at 10:35 PM. Let's start with a limiting case: a pinhole aperture with no lens. 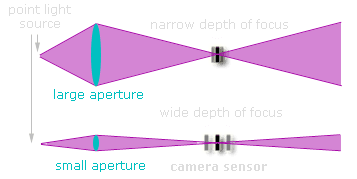 When the aperture is effectively a single point, light which bounces off a given point on your subject, passes through the aperture, and then hits the camera sensor can only have taken one path: directly through the pinhole. This means that you can move the position of the sensor to pretty much anywhere and the light will take the same path -- meaning the image will remain in focus -- meaning there's effectively infinite depth of field. Now, let's make the aperture a little wider and see what happens. If light bounces off of a particular point on your subject, this light can now enter the aperture by passing directly through the center of this aperture (as before), but can now also enter the aperture at a small range of angles, up to the point that the light passes just inside the outer edge of this circular aperture. This means that when you move your sensor, the image created will change focus (with the appropriate lens). The larger the aperture, the more pronounced this effect. Overall: light which originates at a given point on your subject and passes through a larger aperture ends up being more divergent, which translates into a shallower depth of field. This is a crude simplification, and is much better explained using a customized diagram for this purpose, but hopefully you get the idea. Last edited by McQ; 18th April 2009 at 04:08 AM. Re: Why does depth of field change with aperture size? Just to clarify one small point in Sean's excellent post ... when he talks about moving the sensor, he's talking about moving it "forward or backward", not from side to side. Perhaps a crude analogy might be to think about trying to wet someone through a hole in a window with a garden hose; if the hole is small (eg a bullet hole) then for any given position that you're standing in you'll only be able to wet a relatively small and well defined spot on the person, whereas if the hole is much bigger (eg a hole made by a golf ball) then - again, when standing in a single location, you'll be able to wet a bigger (less well defined) area on the person. My apologies for the analogy's severe limitations, but the important part is the concept of "the bigger the hole, the more paths light from a given source can take" (unfortunately my analogy doesn't take focusing into account, but hopefully you get the idea). .........and just to confuse you even further, when you finally grasp the points of the above discussion have a read about "Hyperfocal Distance". This makes use of the laws of physics concerning lenses, and allows you to obtain a massive depth of field in focus. The purple lines represent the extreme angles at which light could potentially enter the aperture. The purple shaded in portion represents all other possible angles. The key concept is: when an object is in focus, light rays originating from that point converge at a point on the camera's sensor. If the light rays hit the sensor at slightly different locations (arriving at a disc instead of a point), then this object will be rendered as out of focus -- and increasingly so depending on how far apart the light rays are. Sean, that has to be the best illustration of the depth of field concept that I have ever seen. Superb information, I will study it some more. I have studied your diagram a bit more, and I second Bill44. Thats a great explanation, the penny dropped with the description of how you get a disc instead of a point. I am very grateful. Ah - another perfectionist boardering on the excessive/compulsive ... just like me! In theory, would it be possible to take an image taken with a wide apperture and process it such that it appears as if it were taken with a small apperture? With sound, I believe its possible to isolate the different wave forms which have been added together to form a rich timbre. So what I'm getting at is being able to take an image and remove the exposure caused by light waves which result in the image being out of focus or in other words remove from the image the exposure caused by light waves which arrived via a high divergence. Last edited by IanIan; 3rd September 2009 at 01:41 PM. You mentioned. "In theory, would it be possible to take an image taken with a wide aperture and process it such that it appears as if it were taken with a small apperture?" If you mean, is it possible to increase depth of field while using the same aperture? The answer is a qualified, "yes" when you shoot digital. See the "Composite Focus" section in this book. This process is also known as "focus stacking" and can be accomplished using Photoshop CS3. I don't know about earlier editions of Photoshop nor do I know about the "focus stacking" ability of other photo editing programs. Here is a tutorial on "focus stacking" using Photoshop CS3. If your photo editing program does not have "focus stacking" capability; there are shareware and commercial programs which you could use to supplement your editing program to achieve focus stacking. I have not worked with one of these supplemental programs. Obviously, when working with "composite focus" or "focus stacking" your camera must be solidly supported (tripod is best) and your image must not move. All times are GMT. Page last updated at 10:19 AM.